Fun pictures and a cute dog make for an appealing look for kids. There is little in the text to distinguish is from other books. 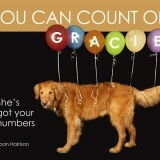 You Can Count On Gracie is a fun book that animal loving toddlers are sure to enjoy. With rhyming verses and adorable puppy photos, it’s a great way to introduce numbers and a love of reading at the same time. One good natured Golden Retriever ushers in a book that will have puppy loving kids everywhere loving their numbers. You Can Count On Gracie – She’s Got Your Numbers is a fun ew picture book by Joan Harrison. Like most early numbers books, You Can Count On Gracie takes kids from one to ten, one page at a time. Each number page features two rhyming sentences that are both appealing to young children, and serve to help kids remember the numbers they’ve heard. If you have young ones yourself, you’ll know that all of that is pretty standard for counting books. Of course, there is a reason for that – it works, and I can’t fault the author for not fixing what isn’t broken. As just a story, You Can Count On Gracie is cute and fun, but doesn’t have much to make it stand out from the crowd of other books just like it. Thankfully, Harrison has found just the thing to do that in the pictures – a sweet dog named Gracie. 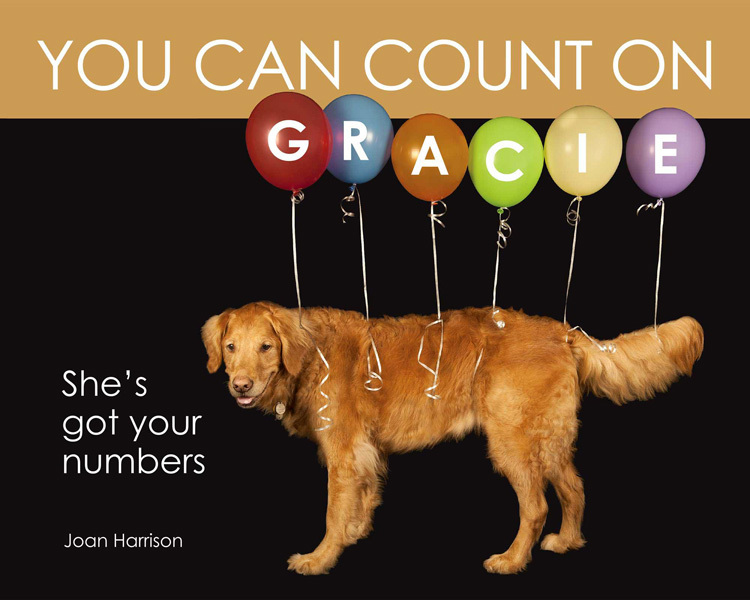 Gracie is Harrison’s own pet, and on each page of the book, she hams it up in completely ridiculous outfits (and wonderfully expressive poses) that are sure to have kids giggling. With outfits ranging from killer red heels, to scholarly specs, to butterfly wings and antennae, Gracie “graces” every page of the book – and appears to enjoy every second of it. She is an adorable dog, and there is little that kids enjoy more than a happy puppy. both of my daughters oohed and aahed over every page, and my four year old begged to take it to bed with her.